Rio Grande’s Nicolas Cam Orellana splits a pair of Southern Oregon defenders during Monday’s second round game in the NAIA Men’s Soccer National Championship at Orange County Great Park in Irvine, Calif. Orellana scored both goals in the RedStorm’s 2-0 win over the Raiders. 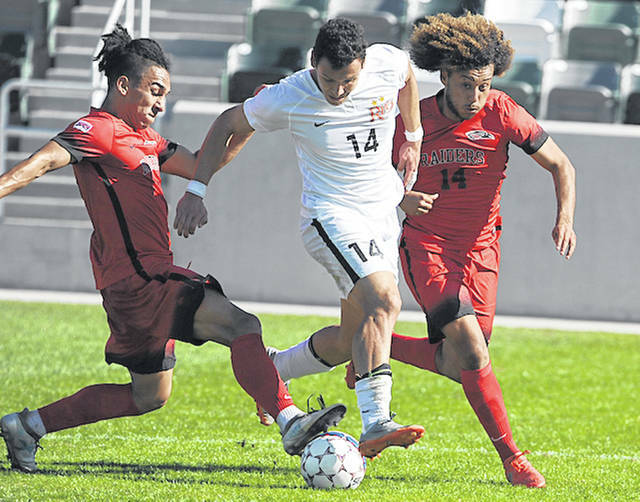 IRVINE, Calif. — Nicolas Cam Orellana scored goals in each half to power the University of Rio Grande past Southern Oregon University, 2-0, in the second round of the NAIA Men’s Soccer National Championship at Orange County Great Park. The RedStorm, the nation’s top-ranked team in the final regular season coaches’ poll and the tourney’s No. 4 seed, improved to 19-0 with the victory and advanced to the quarterfinal round where they’ll face No. 5 seed Missouri Valley – a 2-0 winner over Spring Arbor (Mich.) in another of Monday’s second round contests – on Wednesday at 2 p.m. EST. Southern Oregon, which was ranked No. 14, finished 17-3-3 with the loss. Cam Orellana, a freshman from Santiago, Chile and the country’s eighth-leading goal scorer with 21 entering the contest, scored his first goal just 1:27 into the contest when he headed in a right side crossing pass from senior Harry Reilly (Coventry, England). It was the 18th assist of the year for Reilly, who entered the contest ranked third nationally. Cam Orellana’s second goal came with 35:18 remaining in the contest when he gathered in a pass from senior Eduardo Zurita (Sant Boi de Llobregat, Spain) inside the 18-yard box and waited for a defender to pass by him before finishing in the lower left corner of the goal. Rio Grande finished with a 9-6 edge in shots overall and a 5-1 advantage in shots on frame. Junior Richard Dearle (Castle Donington, England) recorded one save in the clean sheet effort – Rio’s 17th shutout of the season. Wyatt Zabinski recorded three saves in a losing cause for the Raiders.